Built for Captain Stephen Bell she was 80ft 8ins in length with a beam of 23ft 8ins and headroom of 5ft 2ins between decks. Captain Cunningham received a commission dated 14th August 1816, ‘vice Capt. Bell deceased’. In a report compiled for the Admiralty in 1823 the Packet is said to have been ‘purchased of the late Capt. Bell’s Executors, and has had a general repair’. In 1829 Captain Cunningham, then 65 years old, retired on medical grounds with a pension of £150 a year. 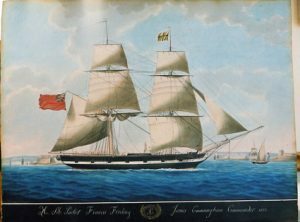 The Francis Freeling was sold out of the Service, re-registered in London, and is thought to have been engaged in whaling between 1831 and 1839. In 1835 she was registered in Sydney. She grounded in 1836 and is believed to have been lost in 1839. The signal flag shown in the painting is listed as belonging to the Francis Freeling in sources between 1810 and 1827. The Leicester, Commander John Sharpe, had earlier used it. The cartouche includes a monogram consisting of the initials ‘JC’, surrounded by dotted and solid oval lines and supported by laurel leaves reminiscent to those on half-pay naval buttons of the period. As James Cunningham held the rank of Master, RN, and must have been on half-pay, there can be no doubt that he commissioned the painting. In this picture the artist provides a good panoramic view of the north coast of Malta, showing the rising ground behind the port and including a view of both Tigne and St. Elmo forts and vessels at anchor in Sliema Creek as well as in Grand Harbour. An interesting local craft is also depicted, apparently larger than those in the other paintings as it has three masts and carries square sails on the fore with lateens on the main and mizzen – a brigantine. At the mizzen head she is flying what appears to be a red flag with a sold black circle on it.